Just don't confuse them with Tolstoy. Despite the name War, even the most emotional and/or politically charged songs by the California based funk band seem to promote peace. Additionally, I think it's safe to say that if you took an informal poll, darn near everyone would attest that "Why Can't We Be Friends?" is far more accessible than the Russian novelist's daunting War and Peace. 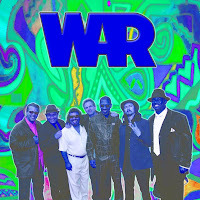 Fast approaching the forty-year anniversary of the band which officially formed in 1969, the true origins of War go as far back as '62 "when Howard E. Scott and Harold Brown formed a group called the Creators in Long Beach, California." However, the true "brainchild" of the band War that fans came to know and love was the creative ingenuity of "Hang on Sloopy" and "My Boyfriend's Back" record producer Jerry Goldstein and the ex-lead singer of the British rock band, The Animals-- Eric Burdon. Four decades of "getting down" later, we find the band has racked up more than fifty million record sales, following a phenomenal output of nineteen albums, ten Billboard Top 10 songs, with tracks being covered by everyone from 2Pac to Janet Jackson and the music of War being featured in not only advertisements but movie soundtracks like Lethal Weapon and Boogie Nights as well. With their newest release consisting of three special commemorative Greatest Hits Live packages available to fans on Tuesday, October 14, War offers their first wholly new work in fourteen years. A must-own for devotees, War's Greatest Hits Live was originally recorded at a late December 2007 sold-out performance at Anaheim, California's The Grove. Available on DVD, Blu-ray, and on a double disc CD, the package will also include a fold-out poster of the band and other exclusives. In preparation for hitting store shelves, Rhino Records was kind enough to send me the 2-CD for review and just in looking over the track listing, you realize it's one for the books. Containing such hits as the album's opener (and one of the stand-out tracks for sheer musicality), "The World is a Ghetto/Get Down," it sets the stage for the versatile offerings of the band which moves effortlessly from fast and slow jams in their unique style which melds together jazz, funk, soul, rock and Latin. Also featuring "Spill the Wine," "Gypsy Man," "The Cisco Kid," "Me and Baby Brother," and "Why Can't We Be Friends?" most fans will want to go straight to the final track of the second disc for a "Low Rider" medley which contains not just the title track but manages to work in a tremendous mixture of "Sunshine of Your Love," "Iron Man," "I Want to Take You Higher" and more. While like most concert CDs, to get the ultimate picture, I did wish I had the DVD at times in order to see the works being performed with my own eyes as some of the instrumentation, arrangements and vocalizations truly amaze, however the best judge of how talented a band really is still remains in how great they sound live, without the aid of "mixing," "re-dubbing," etc. Obviously, War thrives on improvisation and seems to interact with each other in a way that brings them all to a higher level, not only in the true jams like "Ghetto" but also in the slow and ultra-beautiful "So" which ends the first disc. Although normally, I'm not a fan of live albums and would probably reach for the regular Greatest Hits album, this is definitely a package made with the fans in mind as keyboardist Lonnie Jordan noted in the press release that there's been a demand for a live album for many years. And as Steve Huey wrote in his Yahoo Music Biography of the group, War typically kept the groove so loose in original vintage recordings that "they were given over to extended jamming-- in fact, many of their studio songs were edited together out of longer improvisations. Even if the jams sometimes got indulgent, they demonstrated War's truly group-minded approach-- no one soloist or vocalist really stood above the others." Thus, this is a band truly made for live performance as only a few minutes of tuning into Greatest Hits Live will prove. And although the line-up has changed considerably over four decades and new generations have both joined the band and its astronomical fan base, it's this almost instinctive level of harmony and fraternity they give off that makes them truly an American original. Sadly, the last band to play with Hendrix on the night he died, perhaps their biggest triumph of the ethnically diverse band is bringing people together beyond boundaries, emphasizing that we are all one. To this end, as the press release notes, one of their most treasured songs, "Why Can't We Be Friends?" was beamed into space by NASA "to Soviet cosmonauts and U.S. astronauts in 1975." While most fans still will reach for "Low Rider" above any other track as the release cited George Lopez's joke that the tune has become the "Chicano National Anthem," to this listener it's "Friends" that sounds just as good as it ever did and has a message that's even more important today. So in the end, once again, it's a bunch of musicians collectively referred to as War that tries to tell us to give peace a chance.